Once again the week has flown by and Thanksgiving is just around the corner, holy cow! I just need to lock myself in my room for a day of stamping therapy! Today's Friday Mashup is brought to us by the lovely Rita, and I am sad to say that this is our last Mashup with her, as she is stepping down from the design team. I wish her all the best and I've loved working with her. 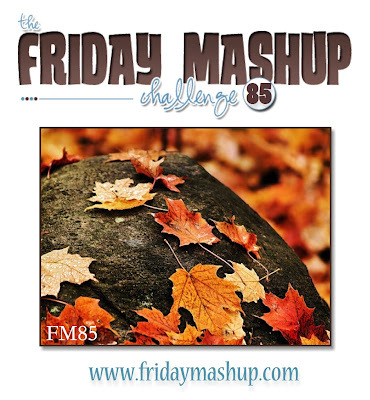 Make sure you come by the Friday Mashup and join us for her last challenge which is.......create a project that gives thanks, create a project with leaves OR mash it up and create a project with both of those elements. I went ahead and mashed it up. This card will get mailed out to my step mom tomorrow! My world is all white now, covered with a blanket of snow, so for my leaves I went with some bold colors. The DSP I used...I was actually going to use the other side of it, which is all Cajun Craze, but I just happened to turn it over while working on the card and decided I liked the way this side of the DSP looked. My inspiration for the sketch came from this weeks Freshly Made Sketches challenge. I just love the big area across the top that can be used to highlight a sentiment, an image, paper...anything! I know I'll use this sketch again and again! Beautiful! I love the sentiment as the main focus. So pretty Lisa1 I love the bright fall colors and clean lines! Thanks for joining us this week at Freshly Made Sketches! How pretty, Lisa! I intended to get some leaves done today for this challenge. So far, no luck. But there's a few hours left in the day! Absolutely GORGEOUS card, Lisa! I love the way you coordinated the DSP with Wonderfall. The sentiment is perfect for this card, and the details are perfect. Thanks for sharing with us this week at Freshly Made Sketches! 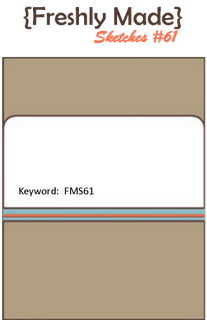 Stunning card! Love the mix of patterns! Thanks for playing with us at Freshly Made Sketches! This is so elegant! I love that sentiment. Great combination of dsp and coloured leaves Lisa, and the scalloped border is a great touch too!